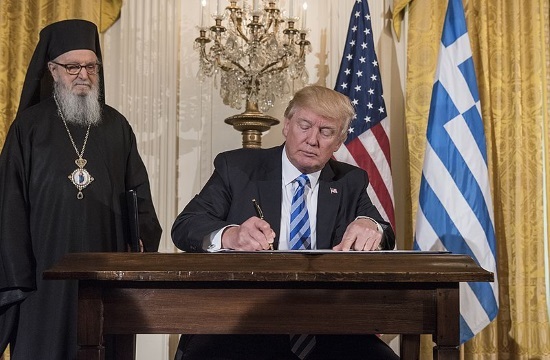 United States President Donald Trump hosted his third Greek Independence Day celebration at the White House on Monday, March 18, 2019 to honor the men and women who fought for Greece’s independence from the Ottoman Empire, according to greekreporter.com. “Today we commemorate the Greeks’ long struggle to regain their independence from a foreign empire”, the President noted in his remarks. “This evening we also celebrate the countless ways Greek Americans strengthened our nation…You live by the values that are the foundations of America’s greatness. “The US and all western civilization have been profoundly shaped by the extraordinary achievements of the Greek people stretching all the way back to the ancient times,” the President continued. He also praised all Greek Americans who served in the US armed forces. Many Greeks, Greek Americans and Americans have attended the ceremony at the White House, continuing the tradition which started in 1987, during the administration of President Ronald Reagan.